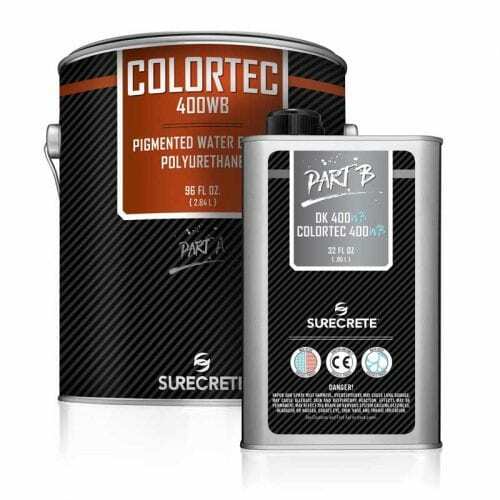 SureCrete’s Dura-Kote ColorTec 400WB™ commercial grade water-based colored floor polyurethane is manufactured to withstand the most punishing use such as forklifts and other industrial uses. 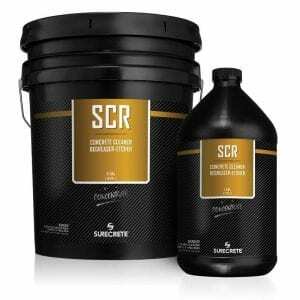 This floor coating has a low VOC rating and can be used in just about any high traffic indoor concrete application. SureCrete’s water based colored floor polyurethane coating is a 2 component 57% solids, acrylic polyurethane designed as a non-yellowing thin mil color coating for concrete, cement-based overlays, or as a top finish coat on epoxy systems. The high performance pigmented top coat provides the durability in high traffic areas as solvent base system with the ease and safety of a low VOC (73 g/L) water base system. Unlike nearly all polyurethanes, Dura-Kote Colored Polyurethane WB has remarkable properties related to vapor permeability that permit its use in an exterior setting. Generating the premier balance of strength, added UV stability, flexibility, chemical and scratch resistance, it is both user-friendly and extremely durable. Finding an eco-friendly concrete sealer that is also extremely durable can be quite difficult, much less a colored version of that product. Typically, a pigmented, environmentally friendly interior floor coating can only be accomplished using a colored 100% solids or water-based epoxy in conjunction with a clear water-based polyurethane protective top coating. SureCrete has simplified this system, enabling applicators to get a beautiful, durable, eco-friendly water-based concrete floor coating with just one product – Dura-Kote Colored Polyurethane Water Based. 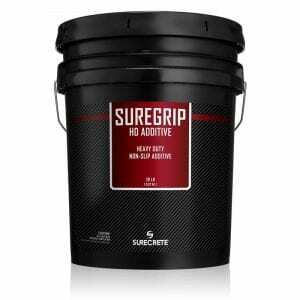 Readily available in a wide array of colors at local distribution centers throughout the country, this colored polyurethane water-based will help you to quickly and beautifully finish your DIY home renovation or commercial project. Mechanically mix the water-based tinted part A portion for at least 1 minute before adding in part B. Now pour 1 part B into three parts An into large mixing container (we pre-measured the kits to make it easy on you!) mix mechanically for a minimum of 3 minutes. Use a premium, de-fuzzed, phenolic core roller to roll out thin coats over the workable area, making sure to maintain wet edges and back roll the entire surface. Two coats are typically suggested with any interior project receiving a polyurethane paint coating, with the second layer being applied as soon as the first coat can be walked on, and is used in the same manner as the first coat. 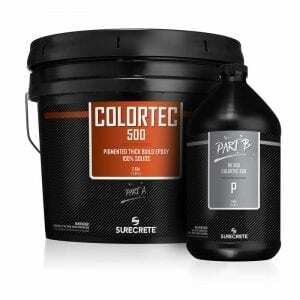 Can I use just one coat of Dura-Kote Colored Polyurethane Floor Paint? Technically yes, however, it is not suggested. For the best results, we highly recommend using two thinly applied coats. That being said, Dura-Kote Colored Polyurethane products have been known to function better than comparable sealers in situations where a single-coat interior floor sealer is required. If you are happy with the color achieved through the first coat of water-based colored polyurethane, then the second coat may be substituted with a thin clear coat instead. Will Dura-Kote Colored Polyurethane WB self-level and fill small holes? To a very slight degree, yes. It is a higher solids content coating than an acrylic sealer, but it does not have a high enough solids content and flowability to fill large voids. 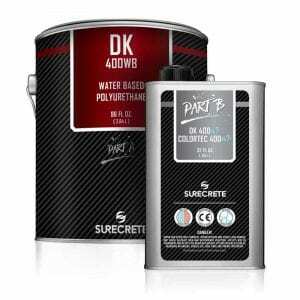 Can Dura-Kote Colored Polyurethane WB be used outside? No, polyurethane paint coatings are not breathable in nature and therefore should not be used in exterior applications. I have strict VOC laws in my area, can I use Dura-Kote Colored Polyurethane Paint WB? Check with your local municipalities to be certain, but given its extremely low VOC rating at less than 75 grams per Liter, this product can be used in almost all states or municipalities. Would this product be a good product to use on a concrete roof balcony that has very small cracks that actually leak into underlying room below? How opaque is this product? Is it possible to use it for a faux finish by rolling on one solid coat and then watering down the next coat, to be applied with rags or sponging etc? I realize you have other products that will achieve this mottled look on fresh concrete, but our job is to refinish previously acid-stained interior floors that will be patched because of foundation repair. We don’t want to overlay the entire 2000 s.f. with concrete. Michelle, This is a great question, however, we would like to talk to you in more detail about this. Please 352-567-7973 and ask for a technical support adviser to get you the best possible solution for your needs.